Whoops! My bad. That was actually Alphonso saying that line! In the original version of the comic -- which I've now fixed -- the speech balloon tail was pointed at the wrong speaker. Errant speech balloon tails are one of the most common mistakes in cartooning! Right up there with Phooey Duck and colouring Sonic's arms in blue. To answer your question -- which is not actually a technically a question, but I'm not going to judge -- maybe I am making excuses! 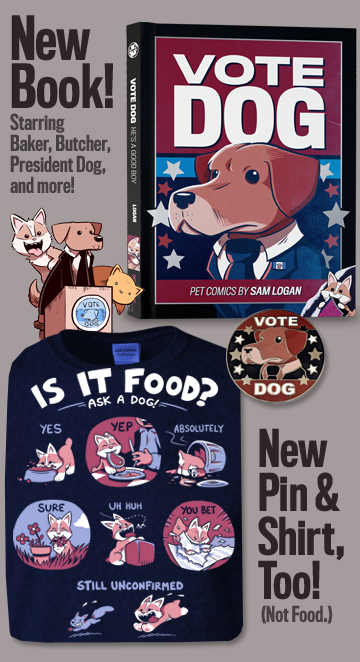 But to be honest, between Sam and Fuzzy, KNOW and YES Mag, and commission work, there's not a lot of time left for any extra comics, let alone insane ones. I do like to think that deep down, I'm a cool person who lets the project dictate the content, and that if I ever was working on a story or piece that I felt really needed to be a "mature" one I would do it and not be a total wuss about it. Then again, I also like to think that shoes and socks look good with shorts. So, you know... take this with a grain of salt. Whew! I'm back home, resting after the flurry of holiday travel! Enjoy today's comic! I'll be back on Friday with another one, plus a brand new round of Q and A. See you then! I've been wanting to do another Malcolm-focused strip for a long time! And who better to explain the infamous "Boxing Day" to our non-commonwealth friends? No one, obviously. 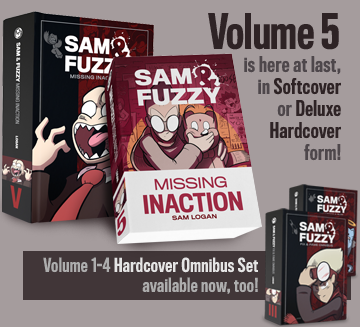 Is there anyone out there who picked up a copy of Sam and Fuzzy Are Very Famous but has still not received their Book Club Bonus Pack? Email me and let me know! We return to our regular story on Wednesday. See you then!